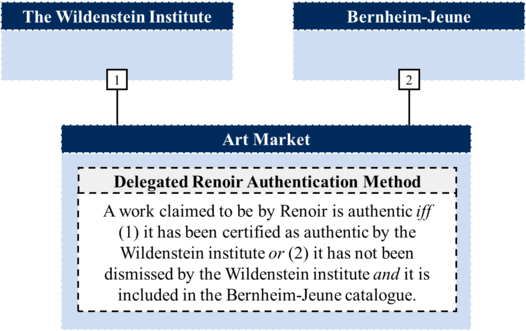 Accept the following reconstruction of the contemporary authority delegation structure in the art market regarding the works of Renoir: a work claimed to be by Renoir is authentic iff (1) it has been certified as authentic by the Wildenstein institute or (2) it has not been dismissed by the Wildenstein institute and it is included in the Bernheim-Jeune catalogue. The modification was suggested to Scientonomy community by Mirka Loiselle on 19 May 2017.1 The modification is currently being evaluated; a verdict is pending. A work claimed to be by Renoir is authentic iff (1) it has been certified as authentic by the Wildenstein institute or (2) it has not been dismissed by the Wildenstein institute and it is included in the Bernheim-Jeune catalogue. This page was last modified on 19 May 2017, at 16:26.